Hikers are sometimes referred to as walkers. That is the term I saw in the book that I read,"On the Beaten Path: An Appalachian Pilgrimage ". Hiking or walking can mean different things to different people. Perhaps your idea of hiking is parking at the far end of the Walmart parking lot and then walking to the store. Perhaps your idea of hiking is just walking around the campground where you are staying or maybe taking a hike on one of the nature trails located close to your campground. Perhaps you are one who likes to be more adventuresome and take long hikes in National Parks and maybe even do some back country hiking and camping. Whatever your idea is of hiking, my intention here is to address the benefits of hiking as it relates to those of us who are RVers. The word “hike” as defined in the dictionary is, “to take a long and vigorous walk“, but your hike doesn’t have to be vigorous just as long as you get out and do it. Think of it as just taking a long walk or if your not able a short walk. As I see it, there are two types of hikers. One is the guy or gal who likes to hike for the sake of hiking. They may not be RVers but rather outdoor enthusiasts who drive to a trail head and then head out on long hikes that might last for a day or two. They will probably be younger and more athletic than the average person. That’s not to say that some of us older types aren’t in that category. The other type of hiker is the casual type. Rvers, I believe, fall into this category. 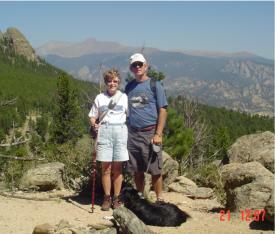 We are the ones who like to take advantage of the hiking trails in our National Parks or forests or any where we camp. We take short or long day hikes and get back to the camper before supper. We all know about the benefits of getting good daily exercise, right? Well when traveling through this great land, what better way to get that exercise than to take daily hikes or walks. Some of the best scenery that you will see is not from a campground or taking a scenic drive, but rather from a hiking trail. No matter what shape you are in, there is usually a trail you can master. So what does it take to go hiking? The answer to that question depends on what type of hiking you plan on doing. For those of us who I will refer to as RV hikers, there is not a great deal involved other than finding the trail you wish to hike. However, there are some basic things that you should pay attention to depending on where you hike. The most obvious thing to do is to dress for the occasion. It is a good idea to get a good pair of hiking boots if you plan on doing a lot of hiking. The foot ware is very important. It is not a good idea to hike in flip flops or street shoes. A good pair of tennis shoes is okay as long as the walk or hike is on relatively flat ground. When you hike up hills with loose dirt and rock, then you need shoes that will give you good ankle support. It is also a good idea to have walking poles to provide additional support, especially coming downhill. The type of clothing that you wear will depend on the climate where you are hiking. If hiking in the high mountain areas, then you will need to be prepared for changing weather conditions even on moderate hikes. The weather in the mountains can change very quickly. Therefore, it is a good idea to have a jacket and rain coat even on bright sunny days. On the other hand, if you are hiking in low altitude areas then dress for the current weather. Being prepared for the unexpected is necessary. Carry plenty of water for the length of hike that you are taking. If your hike will last for several hours, then be sure and take some snacks. Your backpack should include a basic first aid kit. You might think that you’ll never need to use it, but it is better to have one and not need it than to need it and not have it. My wife always carries water proof matches and one of those very thin sliver survival blankets in case we get caught in a snow storm in the middle of summer. It actually isn’t a silly idea considering that the night time temps in the mountains can drop close to freezing on any night. If you are ambitious and take a long hike in a national park or national forest, take a trail map and know your route. Most national park trails are well traveled but some national forest trails aren’t always well marked or heavily used. The last thing you want to do is to get lost. Always let someone know where you are going if you are hiking alone, but the best policy is to hike with a partner. A couple other safety devises are the cell phone and possibly a hiking type GPS if you plan to get off the trail. Getting lost is usually not a problem that would be encountered by a RVer, as it would be for someone who goes into the back country. We are talking about RVer hiking here! My wife and I hike everywhere we travel. It is a great way to get exercise and fresh air. We always take our dog hiking unless we are in a National Park, in which case you can’t take your dog. One way to judge whether you are getting enough exercise is to take a look at your dog. If your dog is getting fat, you aren’t getting enough exercise. Get out and enjoy the fresh air!